he atmosphere of the workplace has changed dramatically in recent times. Ever since the exploitative practices of the industrial revolution were removed through legislation, work has been defined as a place where a person could find fulfillment through a job which was rewarding and paid a fair wage. But this definition has reverted in recent years to one in which the needs of the employee have become less important. Finding personal fulfillment through our work has become more of a challenge. Progressive occupational stress leading to job burnout has become a painful reality for many people. This is especially true during times of high unemployment – when the workers who are still employed are expected to carry the load of those who are no longer with the company. layoffs occur with alarming frequency. Where one income used to support a family, now it usually takes two – and this has a major impact on the dynamics of raising a family. As a result of these changes in the workplace, stress has increased dramatically for some workers. Job stress is the result of overload on our senses and our inability to complete tasks. We are presented with more demands, information, stimuli, and intensity than we can take in and process. The end result of prolonged exposure to this stress is job burnout. We progressively shut down under the demands placed on us from the outside world. When we have difficulty in setting priorities and putting our lives into balance, we are more prone to suffer from burnout. We feel that we cannot keep up with everything we have to do. Not only is our work intense, but we also have demands to participate in family life, keep up with friends, and complete our normal chores of everyday living. We feel a decreased ability to set limits on these various demands. We then begin to feel a vague sense of just not caring so much about work, or maybe anything, anymore. We feel overwhelmed and then we retreat. Burnout often starts as a feeling of fatigue – physical, mental or emotional – which lasts increasingly longer. Weekends, holidays, vacations and customary diversions just don’t give us a sense of renewal any longer. We start to withdraw from coworkers and supervisors. We aren’t as attentive to our responsibilities. We may see increased substance abuse (alcohol, drugs, tobacco), changes in our appetite, sleep disruptions, or the onset of physical or emotional health problems. We “arrive late and leave early.” We may become increasingly angry, hostile and depressed. In severe burnout we may experience a feeling of disconnection and complete loss of interest in our job. Our self-esteem suffers. As our feelings about work become totally negative, chronic absenteeism can become a problem for both the individual and the organization. Many are only partially aware, however, of the erosive impact that job burnout has on our lives since we tend to ignore chronic and progressive stress. We often feel that we can and must continue to persevere in overload mode, especially considering our cumulative heroic efforts through the present to keep up with our work demands. We drive ourselves to go on and on, as tired and pessimistic as we may be. Others may see the symptoms earlier than we can. Coworkers may notice a change in work habits or the quantity and quality of our work accomplishments. Our primary relationships may suffer. Our friends may complain about our lack of availability. Unfortunately, it is often those who show the most promise at the beginning of their careers who later succumb to burnout. They are idealists, perfectionists, and workaholics. They are high achievers who have high energy levels and positive attitudes initially. They are dedicated to their work and committed to doing well continuously. Needless to say, more work gets shunted their way. Over time, however, the relentless stress and the inability to cope with the demands of the job lead to burnout. Interpersonal Problems – When we feel drained emotionally at work, it becomes more difficult to deal with other people. When expected conflicts occur, we may overreact with an emotional outburst or increased hostility. We may also start to isolate ourselves from other people. We send out messages in our behavior that we are not as present or as available to others as we have been in the past. We might experience a decreased desire to socialize or to pursue our usual activities outside of work. Emotional Fatigue – It is common to feel dissatisfied, angry, frustrated or depressed from time to time. When we are caught in the burnout cycle, however, these negative emotions become our predominant reactions. We express these feelings even when the situation does not merit negative responses. In more serious instances, severe mood problems (such as mood swings or destructive thoughts) may become evident. Maintaining oneself throughout the day becomes tiring – we lose our feeling of satisfaction on the job and the ability to face challenges with a positive attitude. We may eventually experience a numbness and have difficulty in feeling much of anything. Low Productivity – During the burnout phase it is common for us to experience boredom with the job and a loss of enthusiasm for our projects. We may feel disillusioned or cynical. We may find it difficult to concentrate and harness our energy to produce the quality of work that we have in the past. We begin to question whether our work is meaningful. To compound the problem, we find it difficult to see how things can change and we feel hopeless about finding a solution. 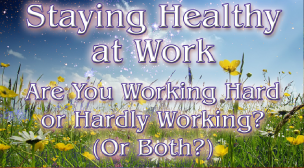 Health Problems – As our emotional reserves are depleted, the quality of our relationships deteriorates, and our thoughts about work become more negative, we may begin to experience physical problems. We may feel tired and run down. Some common physical symptoms include headaches, back pain, colds, insomnia, rashes or hives, chest pains or palpitations, gastrointestinal problems, and nervous tics. Sleep problems are common, ranging from restless, fitful sleep, to nightmares, to early awakening with our first thoughts on the upcoming day’s work demands. Addictive Resolutions – To cope with the chronic stress of the job, we may resort to substance abuse. An increased intake of caffeine on the job is common, along with nicotine addiction and the use of legal drugs such as prescription medication and / or alcohol. Some people resort to illegal drug use. Normal activities such as television or computer use can also become addicting. An increase or decrease in food intake may accompany job burnout. These attempts at self-soothing, however, further compound the problem and fail to address the real issues. Obsessive Thinking – During our non-working hours, work continues to be on our minds, even when we are physically involved with other pursuits. Our usual spiritual, religious or recreational practices fail to sustain us in the face of what we deal with on a daily basis. We have a decreased ability to place our work into a larger and more meaningful context. Our thoughts involve a continuing focus on problems rather than on solutions. Burnout is not an all-or-nothing condition. Rather, think of it as a progressive wearing-down – ranging from normal feelings of getting a little tired of your job to a state of complete exhaustion. Most workers suffer from some of the symptoms of job stress, if not burnout, from time to time. With careful examination of what is contributing to our stress and attending to our needs for well-being, we can usually halt the wear-down and revive our enthusiasm for work. Frequently we must take an in-depth look at how we work – and live – in order to turn our stress into an opportunity for personal growth. Examine Your Denial. When we are exposed to stress over long periods of time, we tend to deny that there is a problem. The first step in learning to cope with job stress is to listen to the wisdom of our bodies. Freely admit and come to accept that you are under stress. Identify the sources of your stress and learn how you are reacting to them. Coming to terms with burnout is difficult, if not impossible, unless we stop denying that there is a problem. Avoid Isolation. When we are burdened with constant job stress, dealing with other people is often the last thing we want to do – despite the fact that developing closeness and emotional intimacy with others is one of our most effective ways of buffering ourselves from pressure. Closeness brings new insights and also decreases the negative effects of agitation and depression. Reduce Intensity in Your Life. Examine those areas of your life that involve the most concentrated intensity and then work toward alleviating that pressure. This can involve both work and non-work tasks. For example, if your anxiety increases with certain areas of work (meetings, long hours crunching numbers, etc. ), see if you can either eliminate those tasks or take a new approach toward them. If you have to make dinner every night after a long day on the job, see if other arrangements can be made at least some of the time. Question whether you really have to watch the news on TV every night – or whether spending some quiet time with music or reading might be preferable. Learn to Pace Yourself. Like everything else in nature, our bodies need up times and down times – time to work and time to rest. We need moderation and balance. We can work intensely for a while, but then we need to take a break. Insert some quiet and relaxing interludes into your daily routine. Minimize Worrying. Worry solves very few problems, but it does increase our general anxiety. If you find yourself obsessing over your concerns, and perhaps losing sleep in the process, write them down, talk them over with a friend, come up with a real solution to the problem, take action – and then let it go. Take Care of Your Physical Needs. When our bodies are run down, we are more susceptible to burnout. Make sure you have a nutritious diet (especially a good breakfast), but avoid abusing yourself with rigid diets. Try to get as much exercise as you realistically can. Avoid addictive substances. And get plenty of sleep. Nurture Yourself More Than Others. Likely candidates for job burnout are those who are more concerned about caring for the needs of others to the detriment of caring for their own needs (this is why nurses, doctors, teachers and others in the helping professions are prone to job burnout). Some people seek the approval of others by agreeing to take on enormous projects and working long hours. Rather than nurturing others as your first response, try nurturing yourself. (If you are drained all the time, how can you effectively help others?). Learn to say “no.” Try delegating responsibilities to others rather than taking on an overload yourself. Try sorting through what is meaningful in your life and separate it from those things that are temporary and fleeting. Learn what is essential, and what is nonessential, for your happiness. Examine how your work can become a reflection of your essential self, and, if it cannot, consider ways to modify your current work or perhaps go into a new career altogether. Working with a trained therapist on these questions can open the door to a brand new way of living ... with contentment, integrity, and true satisfaction. Burning out can be an awful experience. After all, many of us spend most of our waking hours on the job – more hours, in fact, than we spend with our families and friends. When this enormous part of our lives becomes so stressful, along with worry, self-esteem issues, anger, depression and withdrawal, a major personal crisis is generated. Our first impulse is to deny that job stress is finally getting the best of us. We persevere and keep doing the same things every day, working even harder as if that might be the answer to finding relief. But the cycle is futile. More work is not going to alleviate the problem of working too hard – and it further depletes our emotional reserves. What am I trying to accomplish with my worklife? What are my key interests – and does my work fit with them? What are my key skills – and does my work use them? What are my core values – about life balance, about family, about money, about the treatment of people? Is my work in synch with these? Am I overworking? If so, why? and what is it preventing me from accomplishing? While these are questions that everyone grappling with occupational stress should reflect on, we often don’t have the self-discipline and structure to sufficiently explore them. A trained professional can offer a very focused exploration of worklife issues which can enable you to get your worklife stress sorted out and back to thriving in your chosen work and in your life.